Our customized It's My Birthday! 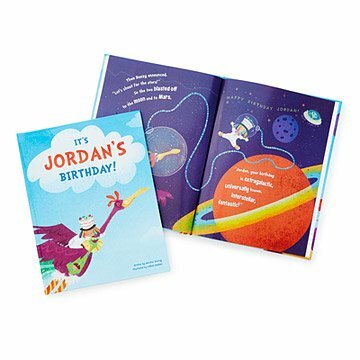 Book takes your child on a grand birthday adventure. A child should always feel important and excited about being alive. But on their birthday, they should feel like the center of the universe. Our customized It's My Birthday! Book does just that by taking your little one on a grand birthday adventure with a friendly purple pal, Buzzy the Bird. In this whimsical and vividly illustrated tale featuring the birthday boy or girl's name throughout, their special day starts with a wake-up greeting from Buzzy. As the adventure builds, the personalized celebration keeps expanding: Buzzy spreads the news to family and friends, throughout your town, throughout the nation, around the globe, and even into outer space! Made in Minneapolis, MN. My granddaughter enjoyed the birthday book. I don't use it because I had given it to a friend's daughter as a present for her birthday. Cute story with non-specific character attributes so it can be applied to any child. I like that I was able to customize the details to fit my niece. Looking for a birthday tradition to start with my son who just turned one. Bought this for his birthday and look forward to reading it to him the night before his birthday or on his birthday for many years to come. The story is adorable and the pictures are so fun! Such a beautiful keepsake. Birthday gift for our grandson. He will love it! Order one for each of my grandkids! This was a personalized book for my granddaughter. She will enjoy it as she gets older...precious moment! When I first received the book, it looked great but all the pages were out of order! I requested a new copy, and was at first given a difficult time saying the artist would not be able to provide me with a new copy, which seemed unacceptable. I had to call a few times and finally received a new copy, surprisingly as a rushed order. The 2nd copy was great and I know my niece will love it!